Dermatitis Relief For The Entire Family. Dermatitis, also referred to as eczema, is an inflammation of the skin that can attack any member of your family. Proper care of this condition is very important. When it comes to our loved ones, know that anyone of any age can contract this disease. Causes range from direct contact with an irritating substance to contracting an allergic reaction affecting the bloodstream. The #1 question frequently asked is, "How can I avoid this condition?" Unfortunately, since a wide variety of substances can cause dermatitis, it is nearly impossible to isolate one specific list. 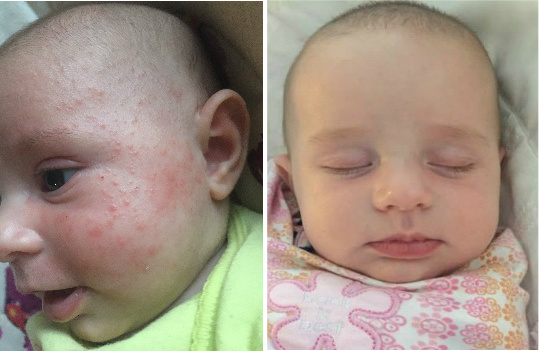 Children, babies and adults alike can experience symptoms of itchy rash like skin. Statistically, 25 to 35% of all dermatitis cases affect the hands of which 75% are school or work-related cases. Allergic contact dermatitis of the hands is very common among certain occupations. This includes health-care professionals, hairdressers and cosmetologists, woodworkers, machinists, and chemical workers and those who work with paper. The second most common sites are the face and eyelids, often due to a reaction to a cosmetic, soap or other personal care product. Inflammation may also show up on other areas of the body such as arms, legs, torso and neck. Irritant Contact D. occurs as a direct reaction of the skin when it is exposed to a chemical or physical substance. Seborrheic D. occurs as red, peeling, oily skin eruptions mainly on the scalp, nasolabial creases, eyebrows, ears, chest and flexural body areas. Herpetiformis, is a very itchy and blistering skin disease caused by an auto-immune response to an antibody. Cercarial D. (swimmer's itch) is an itchy inflammatory sensitivity to parasites that enter the skin by way of infected water in ponds, lakes or other water bodies. 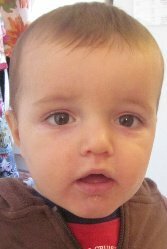 Infantile Eczema when atopic dermatitis occurs in infants, it's called infantile eczema and often involves an oozing, crusting rash, mainly on the face and scalp, but it can occur anywhere. 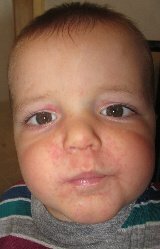 After infancy, the rash becomes dryer and tends to be red to brown-gray in color. This condition begins in infancy and may continue into childhood and adolescence. In adolescence, the skin may be scaly or thickened and easily irritated and the intense itching may continue. Atopic or Allergic D. caused by hereditary and environmental factors which include air-borne allergens, emotional stress, hormones, certain foods, and chemical irritants. Atopic dermatitis often occurs along with allergies and frequently runs in families in which other family members have asthma or hay fever. 3) Wash your sheets often in hot water to get rid of dust mites. Use dust-proof covers on pillows, box springs and mattresses. 4) Wear loose clothes made of cotton and other natural materials that "breathe." Wash new clothing before wearing it. I strongly advise that skin care is very important for your treatment! **Shower in warm water instead of hot water only once a day for less than 10 minutes. A baby or small child may have a short bath. **Wash with a mild "non-soap" cleanser that contains herbal ingredients that are enriching and hypo-allergenic. Ingredients that are plant based, make a cleanser that is just right for all skin types, conditions and ages. Vitamin-derived antioxidants from plant sourced ingredients not only make the best ingredients for your "inside", but for your "outside" as well. **Pat your skin dry with a soft towel. **Moisturizers are extremely important and work well to treat dry skin. Choose the right formulated body creams for where your outbreak or inflammation exists. The cream you apply should be plant based, contain shea butter , stop itching, fight possible infection, and repair skin 7 layers deep and be hypo-allergenic. Remember, the best moisturizers are also the thickest and provide a very rich emollient level. You may need to use it several times a day. In conclusion, my strong recommendation is apply natural, plant based products specially formulated for your skin problems. My mother has been using your Double Strength TheraCream and Face & Body Wash solution for over a month now, and her symptoms have improved greatly. (She has a form of dermatitis that was originally diagnosed as lichen planus.) Her ankle no longer itches and the skin appears much healthier. (This is after nearly a year of suffering, with nothing but hydrocortisone prescribed by her dermatologist.) 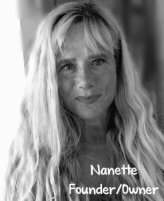 Thanks so much for your excellent products, Nanette. We're very grateful. 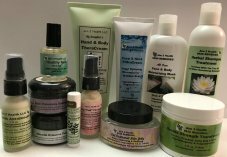 D.W., CT.
Below you will find a link to the natural products I recommend that, in my professional opinion, work BEST for dermatitis. red, itchy, skin all around eye area, burning, itchy, skin all around eye area.